The Rezort takes place in a near-future Europe, 10 years after a devastating global war between humans and zombies that killed two billion people. Peace and stability has now been restored, but millions still live in refugee camps. 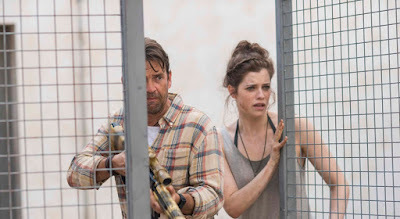 Never letting a good crisis go to waste, an unscrupulous leisure corporation now exploits the surviving zombies for profit, keeping them in heavily guarded reservations on a private island complex called The ReZort. High-rolling humans come to the island on safari, blowing out the brains of the captive undead with sadistic relish.